⋆⋆⋆⋆⋆ School teacher and mother LOVES this! This app is great! Icreate a list with all of my students' names to randomly call onsomeone. At home, I created a list of all the songs that my sonneeds to practice on the piano. 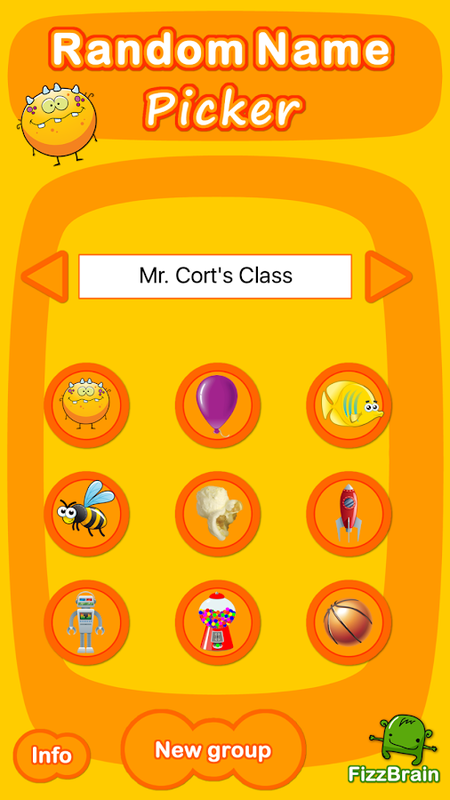 Both my kids and students love it!Also, this app is SUPER user and kid friendly! ⋆⋆⋆⋆⋆ (Customerreview) Whenever you need to choose a random name… or number… orword… Random Name Picker is the fun way to do it! Teachers – choosea random student for questions, privileges, anything – better thandrawing straws! Students can watch in suspense as their name staysin the running – or is eliminated – until the final random name isleft! Choosing the random name is part of the fun – a greatattention-getting device. And you can adjust the speed so that yourrandom name is selected very quickly… or you can draw out thesuspense and fun by slowing it down. Random Name Picker comes with9 fun themes: Monsters, Balloons, Fish, Bugs, Popcorn, Rockets,Robots, Gumballs and Sports.You can also use Random Name Picker tochoose a random answer or review term for students to identify: howabout creating a list with the numbers "9" "12" "18" "21" "24" –and asking students to identify factors for the chosen number? Orhow about creating a list with "triangle" "square" "rectangle""rhombus" "pentagon" "parallelogram" – and asking students toidentify a property of the selected polygon? Example: "Who cananswer this question about our reading text? I'm going to call onthis student… (sports balls with class names on them are kickedaway until only the name "Ethan" is left) …Ethan! "Example: "I wantyou to think of two factors for the number 12. Now I'm going tocall on… (balloons with class names pop one at a time until onlythe name "Madison" is left) …Madison! "Example: "If this student issitting nicely, he/she will be my helper… It's… (fish with classnames are caught one at a time until only the name "Aidan" is left)…Aidan! "Example: "Look at the words that are on the screen andthink about which ones are nouns and which are verbs… Here's thefinal word… (pop corn kernals, some with nouns and some with verbs,pop one at a time until only the word "car" is left) …CAR. Noun orverb? Tell your partner how you know. "You can add as many groups ofwords or numbers as you want to the Random Name Picker. How about alist of… Students in first period,Students on Team 1,Science reviewterms,State capitals,Math facts,Nouns and verbs,Factors andmultiples,Shapes to draw,Polygons to identify,Presidents,Reviewterms for any subject…the possibilities are endless!Your studentswill love the Random Name Picker – I can guarantee that my fourthgrade students do! Team Shake provides a technological and environmentally friendlyway to choose teams for board games, sporting events, tournaments,school projects or anytime groups are required. The newest releasebrings many new features including full Phone and Tablet screensupport, balancing teams based on skill or gender, importing usersfrom a file, and sharing teams via Facebook, Twitter, email andmore. Team Shake is the premier Android app for creating teams.Instead of a hat and scraps of paper, the user enters his friends'names in his phone or tablet and gives it a shake. The screen willthen display a random set of color-coded teams. These teams canimmediately be used for game play or shared via facebook or email.The quick and easy selection of random (or balanced) teamseliminates fighting over who will be on which team. Innovative useof the shake gesture gives users the satisfying feeling of shakinga virtual hat without the trouble of carrying around an actual hat.Conventional buttons can also be used for those who would rathernot shake their expensive hardware about.